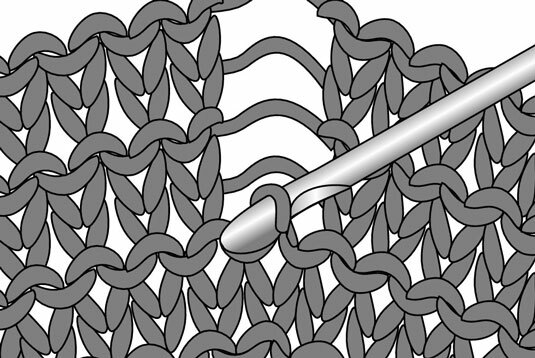 To pick up a dropped stitch from several rows below, you need a crochet hook. Pick up a dropped stitch from several rows below by drawing the unworked strand through the dropped stitch from the front or the back — and that depends on whether you’re working with stockinette stitch or garter stitch. In stockinette stitch: To rescue a dropped stitch from the knit side of stockinette stitch (if the purl side is facing, turn it around), reach through the dropped stitch with a crochet hook and pick up the bottommost strand in the ladder. Then, pull the strand through the stitch toward you to form a new stitch. 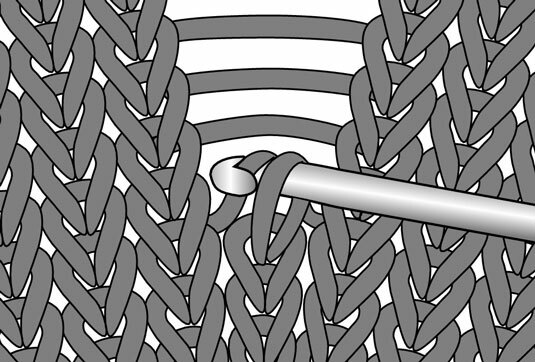 Repeat this maneuver to pull each successive strand in the ladder through the loop until the last strand has been worked. In garter stitch: To pick up several rows of dropped stitches in garter stitch, you have to alternate the direction from which you pull the ladder strands through the dropped stitch. Pull through the front of the stitch to create a knit stitch, and pull through the back of the stitch for a purl. After you determine whether the first stitch to be rescued is a knit or purl stitch, the fix is a cinch. Just fix the first stitch, then alternate pulling stitches from each direction until you’ve pulled through the last strand. Put the last loop onto the LH needle in the ready-to-work position and work it as normal. To determine whether you pull a dropped stitch through the front or back, follow the bottom strand to the side (either way) to see what the stitch connected to it looks like. A stitch that looks like a V is a knit stitch; one that looks like a bump is a purl stitch. If you pull a loop through from a strand in the wrong row, you’ll have a major — and unsightly — glitch in your work. So pick up the strands of yarn in the proper order, and check to make sure that the stitch you’ve made matches the ones next to it. Aim to make your rescued stitches the same size as their neighbors. After you work the dropped stitch in and get back to working your current row, give a little tug on your work in each direction to blend the stitches.